The location was in the sky looking upward in front of my house in Bethesda, MD. The "Take It!" Came from my photographing a photo with snow of my neighbor's great looking house. Out of the corner of my eye there appeared a jet that was leaving a con trail in the picture that I just thought was incompatible. I immediately began to call it a spoiler and started to think of trying to find another day to duplicate the photo shoot when there would not be this spoiler effect. 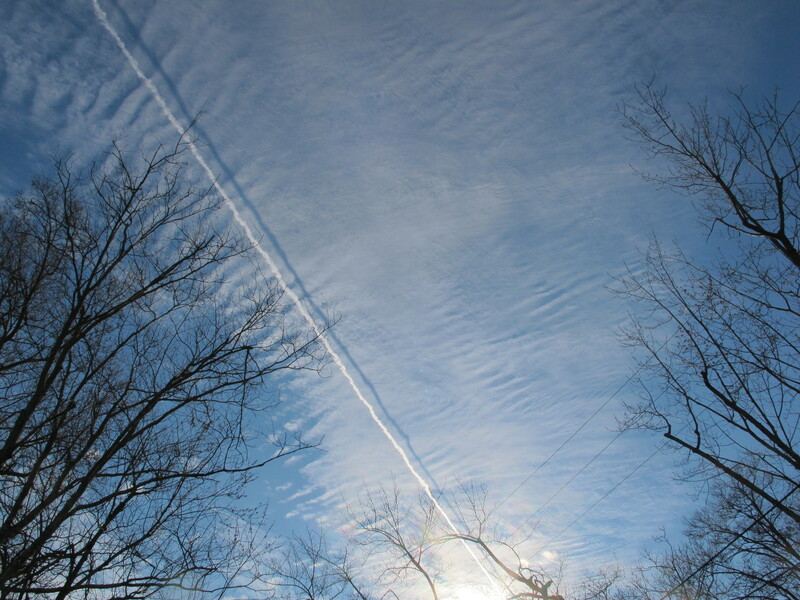 I stopped shooting the house and started to follow the jet as it made its way across the sky almost directly above me. 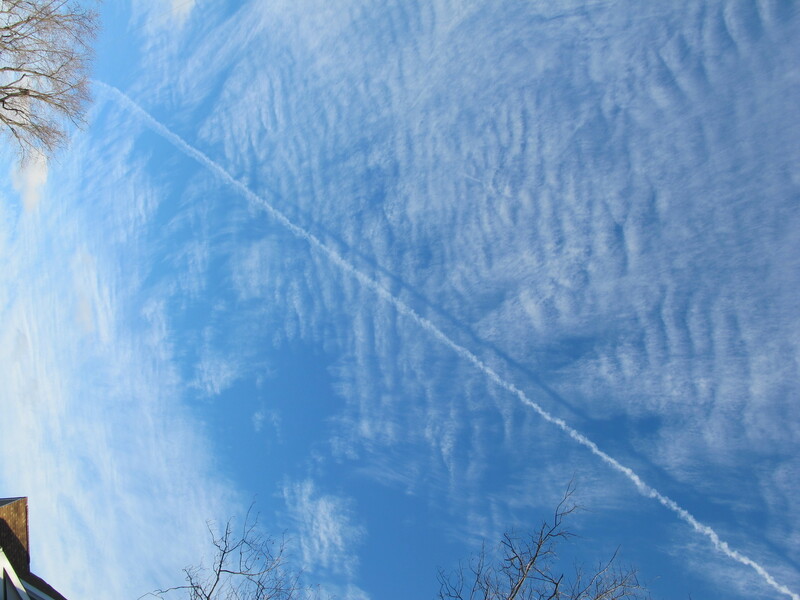 As I watched itI realized there was something quite different about this contrail than any other that I had seen over the years of observing them. What it took some moments to determine was, that there was a shadow formed from the position of the sun that was lower in the afternoon sky than the jet was flying. Further, the jet was flying under a broad cloud cover that was relatively flat with the exception of some ripples in its formation. The cloud cover was much like a sheet as it was not broken up into individual clouds. 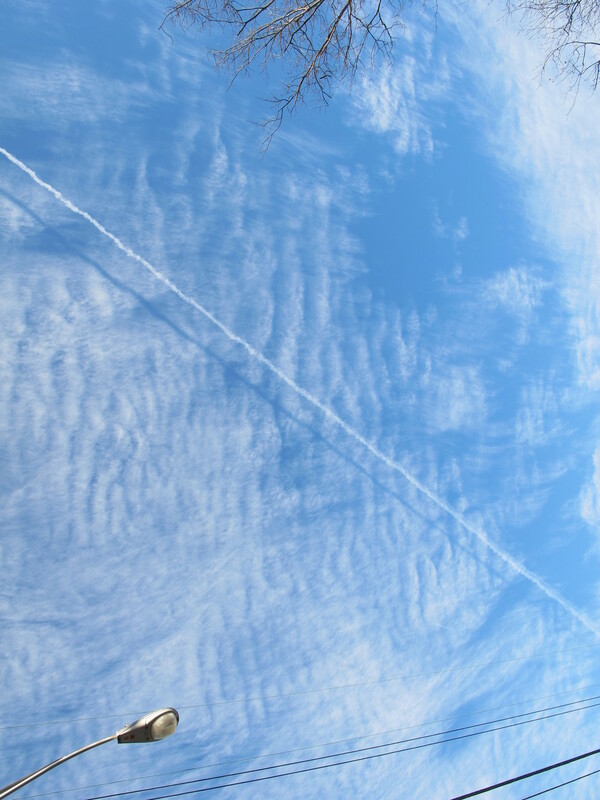 The effect of the shadow being made in tandem with the contrail was quite spell binding to put it mildly. I took several photos of it as it made its way into the lowering afternoon sun. The arrival of it to the end of my range of view produced an effect that was one that had me walking into my house - once again - savoring how great it is to be a witness to so much of what life has to offer. The After Take: Everyone joins me in being spell bound in looking at this. I introduce the photo to the viewer as one that contains something I had never seen before. It being the shadow from the contrail. No one could remember having seen one - so it was a shared amazement. The suggestion of it looking like a river was one from an observer, another said they thought it looked like snow on the ground. The snow idea was on a par with the river water view. One of the great things about this, was the fact that we were looking at the whole thing from an upside down point of view. One of the lessons learned for me with this. was to be willing to take some time to be open to watch something developing as it just might turn out to be a splendor. Wishing you the same joy in viewing this I experienced in seeing it in its formation. I have heard horror stories about those chem trails. Dig the name on this one. It is very fitting. I also really like how the cloud above seems to ripple through the sky. I forgot what that type of cloud is called but they sure are beautiful. That is really cool. I don't think I would have ever noticed anything like that. A shadow of a cloud on another cloud. They are cirrocumulus clouds Teri, c'mon girl you should know that!! Very interesting to see the plains trail just below them. They must've been either ascending or descending. Just got home from visiting my daughter in Oregon and see that I've missed quite a few photos. What a great one to open up first, and I agree with Jim, the name you chose for this shoot is spot on. NY is filled with these things!